Plants can synthesize and accumulate various compatible osmolytes in the cytosol to lower the osmotic potential to sustain water absorption from the soil. The present study aims to evaluate the ability of osmotic homeostasis of 12 desert plants with content of free proline, glycine betaine, treholase, total soluble sugar, and total flavones in experiments study site. The experiments results showed that levels of osmolytes were accumulated at very high levels: about 0.3-1.3 mg/g DW for proline, 20-130 mg/g DW for trehalose content and glycine betaine, 1-18 mg/g DW for total flavones content in the 12 desert plants. Fuzzy Cluster Analysis indicates that the 12 plant species can be divided into five types through plant adaptation mechanism of osmotic homeostasis. The types are as follows: Type 1-five desert plants with high content of glycine betaine; Type 2-four desert plants with high content of trehalose and flavones; Type 3-two desert plants with high content of proline and trehalose; Type 4-one desert plant with high ABA content; and Type 5-one desert plant with higher level of proline, treholase, and betaine. In summary, this work illustrated that proline, glycine betaine, treholase, flavone and ABA are the major osmosis-regulating substances of desert plant which facilitate plants to adapt harsh environment in arid and semi-arid area. Desert plants, Homeostasis, Organic osmolytes. In arid and semi-arid regions, drought stress is a major limitation to plant growth and survival . To adapt the drought stress, plants synthesize and accumulate compounds called osmoprotectants or osmolytes, such as certain polyols, sugars, amino acids, betaines, and related compounds to high levels without disturbing intercellular biochemistry [2,3]. Free proline, one of the most important yet not completely understood osmolytes, is believed to permit osmotic adjustment and to protect enzymes and biological membranes against a wide range of abiotic and biotic stresses in plants [4,5]. It considered as one of the first metabolic responses to stress. Furthermore, it also functions as a second messenger . Other osmotic compounds such as glycine betaine, sucrose, trehalose, and flavones functions have the same way as free proline . The dominant plants in the Tengger desert are Cornulaca alaschanica, Corispermum mongolicum, Bassia dasyphyua, Agriophyllum squarrosu, Atraphaxls bracteata, Calligonum mongolicum, Artemisia ordosica, Artemisia sphaerocephala, Caragana Korshinskii, Tamarix hispida, Peganum fiarrnala, and Caryopteris mongolica among many others. These belong to the Chenopodiaceae, Polygonaceae, Compositae, Fabaceae, Tamaricaceae, Zygophyllaceae, and Verbenaceae families. Some of these plants have special succulent characteristics whereas others, being little shrubs, exhibit slow growth. Experimental results show that these desert plants have very important ecology function in the Tengger Desert. In the Shapotou area on the Southeastern Tengger Desert, shrubs such as Artemisia ordosica and Caragana korshinskii were planted in straw rids to control rainfall infiltration into the soil and water loss to fix sand dunes, afterward re-vegetate ecosystem and promote surface soil properties [8,9]. It was made Shapotou area on the Southeastern Tengger Desert as one of the most successful environmental protection system in the China, which protects the Baotou-Lanzhou railway from sand encroachment where the line passes through an area of shifting sands on the southeastern fringe of the desert [10,11]. This research attempts to detect content of osmotic substance and clear their main effects osmotic regulation mechanisms. This work will further support the evidence of these plants adapting the arid and semi-arid desert environment. The plants samples were collected from the Shapotou Desert Research which located at the southeastern edge of the Tengger Desert in Northwestern China. Shapotou, as a transitional zone between a desert and an oasis, characterized by high, dense, and continuous reticulate barchan’s dunes with 1% natural desert vegetation covers . The soil substrate is loose and impoverished moving sand with moisture content of between 3% and 4%. Based on 58-year meteorological records (1956-2013), the mean annual air temperature in the area is 9.6°C; the minimum and maximum temperatures are -25.1°C and 38.1°C, respectively. Mean annual precipitation is 186.6 mm; mean annual wind velocity is 2.9 ms−1; and the number of days with dust events is 122 d per year. Soil water contents were about 1.56-6.1% from 10-140 cm deep in October, 2006. The mean air temperature of meteorological data was 14.88°C, the mean air moisture was about 39%, and the total rainfall was 5 mm. Some experiments were performed in the Experiment Station Plant Garden which has the similar features as the Shapotou Desert Research. The local climate and condition were often considered to be dry and cold. Twelve dominated species of the Tengger Desert plants from the Shapotou Desert Research and Experiment Station Plant Garden were selected in this experiments. The plant species, family name, and leaf water content data were listed in Table 1. Young fresh plant leaves from annual shoots were harvested from fully developed plants on October 25, 2006. Their water content in the leaves of these plants was up to 60%. Four fresh leaves from each plant were dried to about 20 g to measure the osmotic regulation substances Table 1. Table 1: System suitability test parameters for CFB the proposed HPLC method. Proline-Proline was measured as described by Bates et al. using 100 mg of frozen plant material which was homogenized by 1.5 ml of 3% sulphosalicylic acid . Total soluble sugar-Soluble sugar was performed according to Dubois et al. with minor modification. Trehalose-Trehalose concentration was measured via the anthrone colour method with eight replicates . Approximately 1 g of dried leaves was immersed in pre-cooled normal saline for at least 10 minutes. Then trehalose was extracted for 30 minutes with about 0.5 mol/L of trichloroacetic acid solution in an ice bath. Glycine Betaine-The measurement of glycine betaine was performed according to Grieve and Grattan . Total flavones-Total flavones content was determined by a colorimetric method described by Jia , with some modifications. ABA-ABA extractions were performed according to Benschop et al. . Per sample, 20 mg of freeze-dried leaves was homogenized in liquid nitrogen and extracted in 5 ml of 80% (v/v) methanol containing 20 mg L-1 butyrate hydroxytoluene in the presence of 6 ng deuterated abscisic acid (ABA) and 50 kBq3H-ABA (Sigma-Aldrich). Proline content was in the range of 0.3-1.3 mg/g DW for the 12 desert plants which was regarded to be high compared to the normal plants, result was shown in the Figure 1A. Figure 1: Effects of proline (A), Total solute sugar (B), Trehalose (C), Betain (D), Total flavones (E), and ABA content (F) of 12 desert plants during adverse desert environment stress. 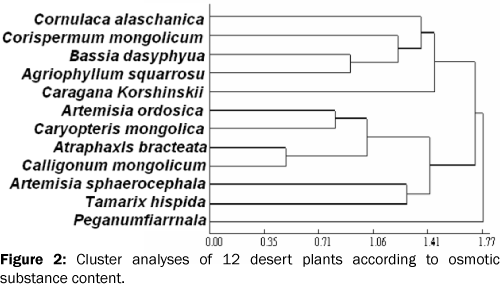 Total soluble sugar contents were much higher in the 12 selected desert plants compared to normal plants. Data was shown in the Figure 1B. The trehalose content of the 12 desert plants ranged from 20 mg/g DW to 110 mg/g DW and increase very quickly under adverse desert climate, as shown in Figure 1C. The glycine betaine content in eight of the 12 desert plants was accumulated within the 30-130 mg/g DW range, as shown in Figure 1D. Total flavones content in this experiment are increased from 1 mg/g DW to 18 mg/g DW in most of the selected desert plants, as shown in Figure 1E. ABA contents of the 12 desert plants are very high: from 69 ug/g DW to 800 ug/g DW, as shown in Figure 1F and Figure 1. Principal component analysis (PCA) was performed by software of Fuzzy Cluster Analysis system (reference) to find how many types of osmotic homeostasis exist. In Figure 2, the contents of five osmotic regulation substances in the 12 species were divided into five types in plant adaptation ways of osmotic homeostasis-Type 1: Cornulaca alaschanica, Corispermum mongolicum, Bassia dasyphylla, Agriophyllum squarrosu; Type 2: Caryopteris mongolica, Artemisia ordosica, Artemisia sieverstana, Tamarix hispida; Type 3: Atraphaxls bracteata, Calligonum mongolicum; Type 4: Peganum fiarrnala; and Type 5: Caragana korshinskii. The plants in the first type were all belong to Chenopodiaceae. They accumulated glycine betaine content more than other plants which means better protective mechanism through osmotic balance. One of the plant in the second type is belong to composite, another is to verbenaceae and the other two are belong to polygonaceae. These plants mainly accumulated more trehalose and flavones than the other plants. For the third type, these plants accumulated more proline and trehalose. For the fourth type, which belong to Fabaceae, has high level of ABA content. Lastly, the fifth type has a higher level of proline, treholase, and betaine contents than others (Figure 2). Figure 2: Effects of proline (A), Total solute sugar (B), Trehalose (C), Betain (D), Total flavones (E), and ABA content (F) of 12 desert plants during adverse desert environment stress. In this study, the main objectives included the determination of the difference of osmotic adjustment substance in the 12 desert plants in the Tengger Desert and finding different types of adaptation mechanisms of osmotic homeostasis. According to the results, these desert plants clustered into five types with very high levels of osmotic regulation substances in different osmotic adjustment mechanism. The study site shapotou area is located at the southeastern edge of the Tengger Desert in Zhongwai County, Ningxia Autonomous District in western China. Precipitation mainly determines water availability in the soil for plants; but only 3.1% of soil water is available in this region because of the low groundwater level and the highly permeable calcareous sandy soil with scarce clay particles and high evaporative volume. The local climate of the Shapotou region is temperate in arid desert with strong winds, owing to the Mongolian high-pressure system influence. Clearly, these shrubs survive in an extremely harsh environment, and they accumulated osmotic substance content to adapt the extreme environmental stresses. All of the 12 desert plants tested in the experiment are common shrub species in arid deserts and desert grasslands of Central Asia, five plants Caragana korshinsk, Hedysarum scoparium, Caragana intermedia, Artemisia sphaerocephala, and Artemisia ordosica, are the dominates. Many other plants include Reaumuria soongorica, Salsola passerine, Oxytropis aciphylla, Caragana Korshinskii, Artemisia sphaerocephala, Artemisia ordosica, Ammopiptanthus mongolicus, Zygophyllum xanthoxylon, Ceratoides lateens, Nitraria tangutorum, Oxytropis aciphylla, Eragrostis poaeoides, Bassia dasyphylla, Corispermum hyssopifolium, Salsola ruthenica, Peganum harmala, Allium mongolicum, Convolvulus tragacanthoides, Stipa breviflora,Carex stenophylloides, Cleistogenes squarrosa, Setaria viridis, Chloris virgata, Aristida adscensionis, and Corispermum declinatum, are also common. Most of these plants belong to the Chenopodiaceae, Polygonaceae, and Compositae with C4 photosynthesis pathway. They can be considered typical desert plants around the Shapotou area. Proline is known to occur widely in higher plants and normally accumulates in large quantities by an active or effective mechanism of adaptation to drought stress in response to environmental stresses [16-18]. In this study, proline had been accumulated at a very high level in the 12 desert plants, especially in the third types in the PCA clades. In this study, trehalose was also accumulated at very high level, especially in the second types. Trehalose, a non-reducing disaccharide of glucose, has an important physiological role as an abiotic stress protectant in several plants and serves as an osmoprotectant and bimolecular stabilizer under stress conditions . It can reduce the Tm value of the membrane during dehydration, and help cells transform into a glassy state with high glass transition temperature in order to inhibit plasma membrane fusion . Though, the relationship between glycine betaine accumulation and stress tolerance is species- or genotype-specific, the changes in glycine betaine content are very clear in the 12 desert plants in this study. Therefore, glycine betaine is also a main osmo-regulatory substance which activates synthesis pathways of glycine betaine in these desert plants. In this study, the ABA content of the 12 desert plants is very high which supported by Zeevaart’s . Plant growth and development are largely affected by the availability of water. Enhanced biosynthesis of ABA occurs in response to water deficit stress initiates an intricate network of signaling pathways in guard cells leading to stomata closure . ABA levels reportedly were 40-fold in rose within hours in stressed vegetative tissues and decreased after rehydration . Obviously, due to the extremely harsh environment in Shapotou area, the high ABA content was accumulated to reduce water loss through controlling stomata pores on the leaf surface. The present study aims to evaluate the ability of osmotic homeostasis of 12 desert plants with content of free proline, glycine betaine, treholase, total soluble sugar, and total flavones in experiments study site. The experiments results showed that levels of osmolytes were accumulated at very high levels: about 0.3-1.3 mg/g DW for proline, 20-130 mg/g DW for trehalose content and glycine betaine, 1-18 mg/g DW for total flavones content in the 12 desert plants. Fuzzy Cluster Analysis indicates that the 12 plant species can be divided into five types through plant adaptation mechanism of osmotic homeostasis. The types are as follows: Type 1-five desert plants with high content of glycine betaine; Type 2-four desert plants with high content of trehalose and flavones; Type 3-two desert plants with high content of proline and trehalose; Type 4-one desert plant with high ABA content; and Type 5-one desert plant with higher level of proline, treholase, and betaine. In summary, this work illustrated that proline, glycine betaine, treholase, flavone and ABA are the major osmosis-regulating substances of desert plant which facilitate plants to adapt harsh environment in arid and semi-arid area. Kramer PJ and Boyer JS. Water Relations of Plants and Soils.AcademicPress; ISBN: 0124250602. 1995. Bohnert HJ and Jensen RG. Strategies for engineering water-stress tolerance in plants. Trends Biotechnol. 1996;14:89-97. Nuccio ML, et al. Metabolicengineering of plantsforosmotic stress resistance. CurrOpinPlant Biol. 1999;2:128-134. Sharma SS, et al. In vitro alleviation of heavy metal-inducedenzymeinhibitionby proline. Phytochemistry. 1998;49:1531-1535. Basak M,et al. Biochemical responses of Camelliasinensis (L.) O. Kuntzeto heavy metal stress. J Environ Biol. 2001;22:37-41. Hare PD and Cress WA. Metabolicimplications of stress-inducedpralineaccumulation in plants. PlantGrowthRegulation. 1997;21:79-102. Zhao X, et al. Effect of salt stress on growth and osmoticregulation in Thellungiella and Arabidopsiscallus. PlantCellTissOrganCult. 2009;98:97-103. Wang XP,et al. Evolutionary characteristics of theartificially revegetated shrubeco system in theTengge zr Desert: Northern China. Ecological Research. 2006;21:415-424. Xiao HL,et al. Impact of evolution of plant–soilsystem on the water environment during the mobile dunesstabilization. Acta PedologicaSinica. 2003;40:809-814. Li XR and Zhou HY. The effects of re-vegetation on cryptogamspeciesdiversity in Tengger Desert,Northern China. Plant and Soil. 2003;251:237-245. Li XR and Xiao HL. Long-term Ecosystem Effects of Sand-bindingVegetation in Shapotou Region of Tengger Desert, Northern China. Restoration Ecology.200412:376-390. Bates L, et al. Rapid determination of free proline forwater-stress studies. Plant and Soil. 1973;39:205-207. Dong Y, et al. Effects of highpressure on theaccumulation of trehalose and glutathione in theSaccharomyces cerevisiae cells. Biochem Eng J. 2007;37:226-230. Grieve CM and Grattan SR. Rapid assay for determination of water soluble quaternaryammonium compounds. PlantSoil. 1983;70:303-307. Benschop JJ, et al. Contrasting interactions between ethylene and abscisic acid in Rumex speciesdiffering in submergencetolerance. Plant J. 2005;44:756-768. Ashraf M and Foolad MR. Roles of glycine betaine and proline in improving plantabiotic stress resistanceEnv Exp Bot. 2007;59:206-216. Ali G, et al. Proline accumulation, proteinpattern and photosynthesis in regenerants grown under NaCl stress. Biol Plant. 1999;42:89-95. Ozturk L and Demir Y. In vivo and in-vitro protective role of proline. PlantGrowthRegulation. 2002;38:259-264. Adridge S. Trehalose boosts prospects for improved biopharmaceuticals and vaccines. Genet Eng News. 1995;15:10-11. Yoshida MN, et al. Production of trehalose by a dual enzymesystem of immobilizedmaltose phosphorylase and trehalose phosphorylase. EnzymeMicrobTechnol. 1998;22:71-75. Zeevaart JAD. Abscisic acidmetabolism and itsregulation. In: Hooykaas PJJ, Hall MA, Libbenga KR, eds. Biochemistry and molecular biology of plant hormones. Amsterdam, The Netherlands: Elsevier Science. 1999;189-207. Mori IC and Murata Y.ABA signaling in stomatal guardcells: lessonsfromCommelina and Vicia. J Plant Res.2011;124:477-487.